The groom's table offers the perfect opportunity to display creative ideas so he can share the limelight with his bride. With a few unique ideas, the groom's table will be one of the highlights for wedding guests. Decorations-toys, gadgets, Transformer robots…whatever he likes! This one's a popular one. So many guys love hunting, you'd be making a tremendous oversight if you didn't add a little camouflage to the table. Take a dark tablecloth and lighter green tulle to decorate the table itself. You can decorate a sheet cake with a combination of animal toys from any toy store and icing made to look like an outdoors scene. A creative, talented baker may even be able to make a cake look like a deer's head or another animal of choice. If that interests you, find a baker who also takes pride in being an artist. Men love their toys, so why not take the gadgets to the table? And toys! Real ones, from their childhoods. How about Transformer robots on the table? The Autobots will protect the cakes from overzealous guests--and the Decepticons. They'll make great keepsakes either for the groom, fellow Transformer fan guests, or kids. Depending on the gadgets or toys you use, the table can be decorated in different colors. If he has a favorite superhero, use the colors of his costume to deck out the table. Toy collections - models, cars, etc. - can also make great table decorations. It's definitely no secret that a high percentage of grooms will be into tools. Have the baker make a cake in the shape of a hammer, for example, if he likes to work with wood. Got a true carpenter on your hands? Bring in a wooden, unfinished worktable. It may look out of place until people realize the connection, but that's part of the beauty of it. Hey, some guys like their work so much it's only appropriate to use a tie and briefcase or something equivalent when displaying their personality. A cake covered in white icing that has a colored tie coming down the middle, over the side, and down onto the platter makes an interesting centerpiece for a man whose work is the other center of his universe (aside from his bride, of course). 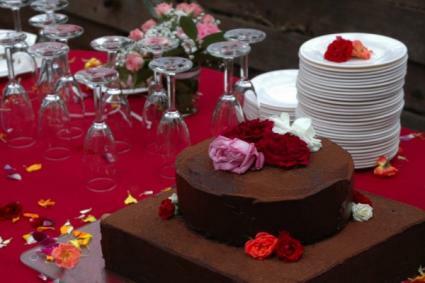 The cake is generally the centerpiece to the groom's table, so wedding grooms table ideas should surely include that! The groom's cake is traditionally chocolate, but it doesn't have to be. If he hates chocolate, pick something he likes. Go for red velvet, almond, strawberry - whatever he will enjoy. Black Widow Bakery offers a completely new spin on a groom's cake - it's made of meat! It's a meatloaf cake with mashed potato icing and a T-bone drawn on top. What cake could be manlier? These are easy. Pick some inexpensive, coordinating frames and choose the pictures of the groom that show him loving life best. Bonus if you can find pictures of the bride and groom doing activities together that the groom loves (fishing, for example). There are many wedding grooms table ideas that you can use to highlight this very special person in your life. Be creative and have as much fun with the decorations as he has with the ideas!